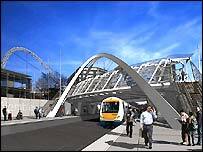 A footbridge at the new Wembley Stadium will be named the White Horse Bridge. The bridge will connect the national stadium, which opens in a year's time, to the town centre and the decision was made after a BBC Five Live poll. It is named after the police horse that was used to restore order following a pitch invasion in 1923 - in the first FA Cup final at the old stadium. Sir Alf Ramsey came second from a shortlist that included Sir Bobby Charlton, Sir Geoff Hurst and Live Aid. The competition was run by the London Development Agency (LDA) which, along with Transport for London, is supporting the £120million development of the area surrounding the new stadium. Is 'White Horse' a good choice? Tony Winterbottom, the executive director of the LDA, described it as an appropriate choice because, like the horse, the bridge would also improve safety and the "whole movement around Wembley". "It shows that people love the story of Billie the White Horse, but it also shows that people supported the 1966 heroes - so we've got to commemorate them somewhere else, I think," he said. The chosen name finished with 34% of the vote. Fans in Germany, Scotland, Australia, Ireland, Wales and New Zealand ran concerted campaigns to promote their heroes for feats achieved against England. The most nominated name was Dietmar Hamann, who scored the last competitive goal at the old Wembley stadium when Germany opened their 2002 World Cup qualifying campaign with a 1-0 win against England.